I was at the Paso Robles seminar and grande tasting event in Oakland awhile back and stopped by the J.Lohr tasting table. I can’t help it. I know they’re a big name brand, but they feel simultaneously local. Maybe its because their Bay Area tasting room is literally around the corner from my house. Maybe it’s because I see them at every Wine Walk up and down the Penninsula. Or maybe it’s because every time I stop by their tasting room, tasting table, etc, I’m greeted with a warm, friendly face willing to talk to me at length about any and all of their wines — from Safeway finds to “members only” selections. So I’m at this Paso Robles event, and I’m talking to Mark Hess, a J. Lohr Regional Manager, and we’re going through the tasting flight when we get to the Syrah. Now this is one that is available to the public, but for some reason it’s hard for me to find — not always available at Safeway, I sometimes have to go to a local market, Zonattos, just to find this Syrah-treat. Mark and I are sipping, and talking, and my mind always goes to “what food would go with this.” And as we discuss this topic, I get hungry. So, the following weekend, I buy this wine and whip up, what I think, is the perfect food pairing. About the Wine: The 2012 South Ridge Paso Robles Syrah comes from the Paso Robles AVA (where as a side note, J. Lohr has 61 acres dedicated to Syrah) in San Luis Obispo County, California. This particular vintage is actually 99% Syrah grapes with 1% Viognier — a common addition in Rhone-style Syrahs to assist with that soft, supple mouth feel and overall balance of flavor. The wine has been stainless steel fermented, 100% malolactic fermentation, and aged for 12 months in oak barrels (20% new barrels from [80%] American and [20%] French origin. Flavor Profile: Love love love the look of this wine. It’s this deep, but happy purple color with a majestic fuchsia hue along the perimeter. Aromas are just as magnificent. The aromas and the flavors go hand in hand hiding nothing of the wine’s generous fruit-filled nature. Sweet plums, blueberries, boysenberries, and an underlying forest-floor earthiness. 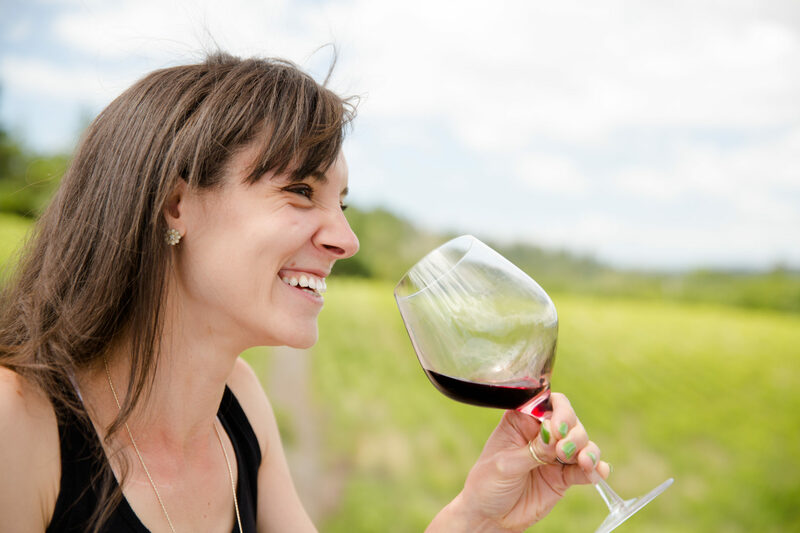 Let the wine linger on your tongue, savor those flavors along with the smooth, round mouthfeel. Those primary essences will then give way to a bit of acidity balancing out the tasting experience with baking spices on the finish — just enough to add interest and intrigue and to have you grasping for one glass more. Food Pairing: Ok, so I started this conversation talking about the perfect pairing, so here it is. 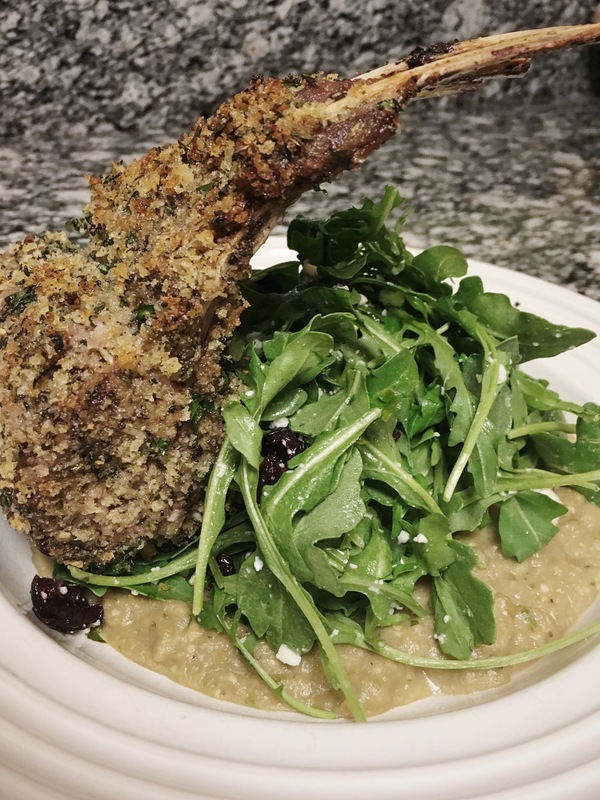 Herb crusted rack of lamb. When I make this dish, the sides vary. This particular evening I experimented with an eggplant puree — pureed with a bit of feta and herbs — topped with an arugula salad which was garnished with some fresh feta and dried cranberries. I don’t like to hashtag yum, but go ahead, hashtag it. More Info: Obviously I’m a big fan of J.Lohr; see other J. Lohr wines profiled on my site. This wine I did find at Safeway on this occasion (Sale Price: $10). For more information about J. Lohr, their various vineyards, and of course to purchase wines directly, visit the J. Lohr website.